Ford of Europe plans to unveil a concept of a small minivan that will replace the Fusion at the Geneva auto show in March, a Ford source told Automotive News Europe. The vehicle will challenge the Opel Meriva, Europe's top-selling small minivan. It will go into production by the end of next year at Ford's factory in Craiova, Romania, the source said, adding that European sales of the minivan will begin in early 2012. Ford, which uses B segment to describe subcompact-sized cars, is likely to call the new vehicle B-Max, as it will be the smallest offering in Ford's European range of minivans that includes the medium C-Max and large S-Max and the large Galaxy. Based on Ford's global B-architecture, which debuted in 2008 with the Fiesta subcompact model, the B-Max will be a five-seat minivan with rear sliding doors, the source said. The Meriva has been Europe's best-selling small minivan since Automotive News Europe began tracking the segment in 2003. Ford Fusion sales peaked at 82,696 units in 2007, when it was No. 2 to the Meriva at 132,715 units, according to data from market researcher JATO Dynamics. 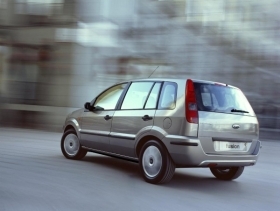 The Fusion, which was launched in 2002 has begun to show its age, sliding to fifth place in the segment last year, behind the Meriva, Citroen C3 Picasso, Renault Modus/Grand Modus and Opel/Vauxhall Agila. Through 10 months, Fusion volumes have dropped 36 percent to 30,577. Ford has said that about 150,000 units of its B-segment vehicle will be built a year at the Craiova plant, 80 percent of which will be exported. The company has no plans to sell the model in the United States. The ageing Fusion has slipped from No. 2 to No. 5 in the small minivan segment. The automaker says added production is crucial to boost output at the underutilized Craiova plant, which Ford bought from the Romanian government two years ago. When Ford made an offer for the former Daewoo factory in July 2007, it planned to build up to 300,000 vehicles and 300,000 engines annually, a rise from about 24,000 vehicles and 116,000 engines built at the facility in 2006. Ford got control of the plant in March 2008 with an original plan to invest 675 million euros by 2012 and begin production of the B-Max by early 2010. This plan stalled because of the global financial crisis, forcing the production start to be re-scheduled to the end of 2011. In July 2009, Ford began producing the Transit Connect small van in Craiova, where 300 units were built in 2009 and 8,500 have been made through 11 months this year, Ford said. Most of the Transit Connects were exported, according to the Automotive Manufacturers and Importers Association (APIA) in Romania. By the end of 2010, Ford will have invested 200 million euros in Craiova, roughly a third of the original total earmarked at the time of purchase. Ford has until 2013 to complete the investment.